Buy 3 patterns from our Foundations SS19 Collection, get 1 free - No code necessary, simply add 4 Foundations SS19 patterns to your cart to receive the least expensive for free! 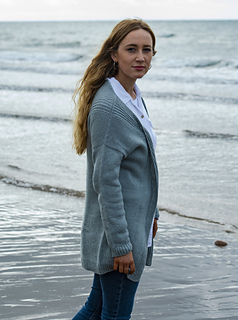 Heritage Coast is an easy-to-wear, open-front cardigan with drop shoulders. 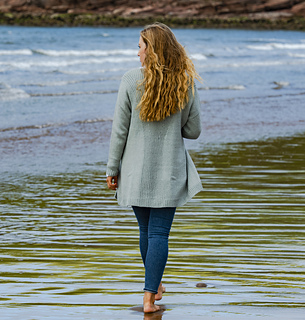 Knitted seamlessly from the bottom up, it features a radiating twisted rib that travels across the back and over the front edges of the cardigan. Lightweight Luma makes it an excellent layering piece in your handmade wardrobe. 15-20 cm (6-8 in) of positive ease. The Fibre Co. Luma (50% merino wool, 25% organic cotton, 15% linen, 10% silk, 125 m (137 yd) per 50 g hank) in Pearl River – 8: 10: 11: 12: 13: 14 hanks. 22 sts and 28 rows to 10 cm (4 in) measured over st st after blocking using 3.5mm (US 4) needles. Foundations SS19: Featuring our favourite warm weather yarns, Foundations SS19 is inspired by the basics needed in every knitter’s Spring/Summer wardrobe. Lightweight shawls layered over Summer dresses and throw-on cardigans for cool mornings; each piece adds versatility, wearability and style to your handmade wardrobe. Knitters of all skill levels will find hours of enjoyable knitting in these simple patterns, whilst novices will learn clever techniques to further progress their skills.